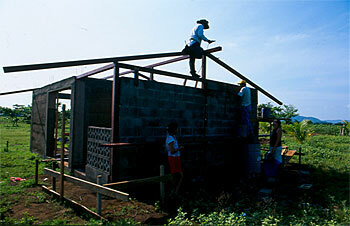 Last summer I participated in a two-week program to build affordable housing in rural Nicaragua. I had found out through a friend about Viviendas León, a nonprofit organization in San Francisco which runs this program, visited the organization's director Evan Markiewicz to learn more details about it, signed up, and went to León. As a landscape designer I felt I could offer useful skills and knowledge to the program besides the physical labor and financial contribution. 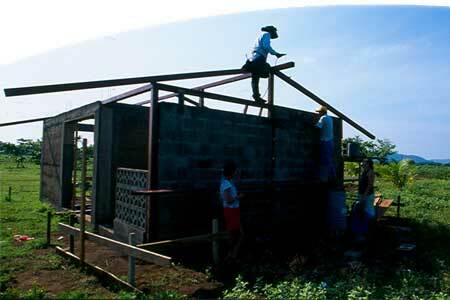 My work in Nicaragua benefited one such agricultural community that had been displaced by the hurricane. The entire population of Goyena, a small village just outside of the city of Leon, fled when the rising water carried away their homes and land. A plantation owner later donated a piece of sugar cane field to the community. 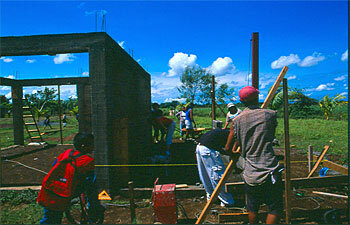 Since then several international organizations came with help to rebuild houses, level roads, and dig wells. There are now sixty new houses, a church, a three-room elementary school and electricity. There is no other infrastructure: People pump their drinking water out of wells, use latrines, burn their trash or simply leave it outside, and do not think much of the puddles in the dirt roads. A few families are still waiting their turn to have their homes built, and meanwhile live in shacks patched up from any material that can be found. 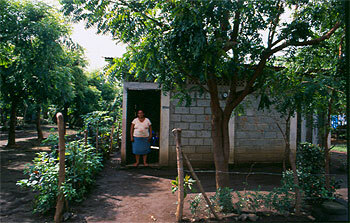 The new houses in Goyena are constructed of cement blocks, which is the most common and economical construction material in Nicaragua. Decorative cement blocks are sometimes used at the top layer below the roof to allow the afternoon breezes in to help cool down the interior. The roof is typically made of corrugated metal with no insulation, and heat inside such a home often becomes unbearable. There is no stucco or other finish on the cement blocks, and as wood is extremely expensive most doors and windows are made of metal. 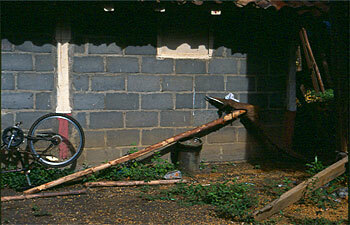 The houses are single story, single room dwellings, with a small kitchen and sometimes a chicken coop attached to the side. They accommodate one family – anywhere from five to fifteen people. I was part of a group of four women, all from the U.S., who helped the local volunteers and community leaders, all also women, to build a preschool. Every day, for six days a week, early in the morning we rode a van to the site at Goyena and worked till noon. The preschool was constructed primarily of rammed earth (the construction material being available as a by-product of well construction the previous year), with a small kitchen on the side made of cement blocks. 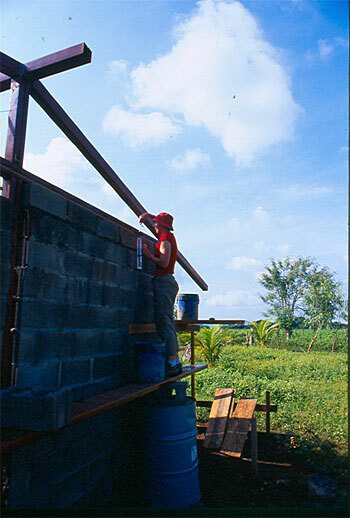 As the rammed earth walls had already been completed by previous volunteer groups, we carried out the masonry work. A local architect and general contractor, as well as the program director supervised our work. 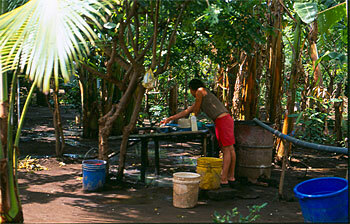 However, progress was slow as we lacked the necessary tools, and the four of us were not used to physical work in the tropical heat. We spent one night in Goyena, and for me that experience was the most notable and profound of the whole two weeks. After the day's work we ate dinner with a few people in the village. We had brought both the food and the water for cooking and drinking with us from Leon, as no one in Goyena could host such an event, and it was prepared by the school teacher who took a day off to prepare it. 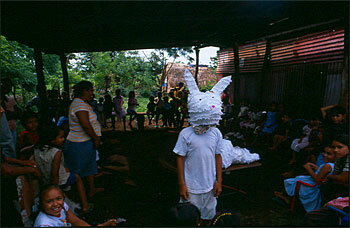 In the evening we hung a piñata for the crowds of local kids who could hardly contain themselves with excitement, sat around a fire and listened to people's stories. We slept in one of the new houses on cots made of old sacks stretched over wooden frames. There were two of us per cot that was already too small for one person, and we tried not to think about the massive cockroaches on the walls and tried not to go to the bathroom in the middle of the night. When we got up early in the morning everyone had already gone off to work or started doing household chores straight away. There were no men around, and the women were doing laundry in the back yard. It seemed that I was the only one looking for breakfast, and there was a definite absence of food in the house. There was no leftover bread on the table, no corn by the fire pit, not even salt. It was striking recognition that three meals a day were a luxury in this part of the world. Even though I had traveled in foreign countries before, my experience in Nicaragua was truly special in many ways. It made me realize much more profoundly how little we need to live, and how much we take for granted. It made me cherish the life I am living. Several people have contributed to the community in Goyena indirectly, and I would like to express my thanks to them: to Charles Pankow Builders and Cliff Lowe Associates for their donations of construction tools, and to Anja Fulle and La Casa del Libro for a significant discount on children's books, all of which I delivered to the community. Nan Croley was born May 28, 1939. She lived in Cleveland, Ohio the only child of English parents, Rose and Preston Croley. Growing up Nan was a Girl Scout, an athlete, an academic, a singer, a yearbook editor, and a student government leader. As a multi-talented National Merit Finalist, Nan could have attended a more prestigious university, but family finances precluded that. She graduated from Lake Erie College, a women's college in Painesville, Ohio. She studied painting, art history, and theater. Nan spent her junior year studying in Dijon, France. In 1963, Nan married Nate Horowitz, a jazz musician she had known in high school. They lived in NYC during the Beat Movement. After their divorce, Nan took the unusual step, for that time, to go back to school; she graduated from the Pratt Institute, School of Architecture in the early 1970's. Three decades later Nan wrote, "finding and sticking with architecture after floating through the first 30 years of my life is one of the accomplishments I am most proud of." One of Nan's first jobs as an architect was designing brownstone apartment renovations in Manhattan. However, she returned to Lake Erie College as an instructor in theater scene design and as a gallery director. A few years ago Nan confided that it was difficult for women to find work in architecture at that time. While on the faculty at Lake Erie College she met her longtime partner, an engineer named Chet Ward. In 1982 Nan and Chet moved to Gasquet, a small town along the Smith River east of Crescent City, California. In Del Norte County Nan lived the life of a river rafter and outdoors person. In 1984 Nan came to San Francisco to practice architecture. She joined OWA the following year and through the organization found housing and met colleagues. She lived in the Mission and North Beach and then purchased a multi-unit building on Polk Street. While living in the city she immersed herself in its cultural offerings. She also loved to travel and collect fine art, crafts, jewelry, pottery, and rugs from local artisans. From 1985-87 Nan was on the OWA Steering Committee. She wrote an article for the April 1987 newsletter tilted: On Connecting. "Ideas can flow from a variety of settings. It's not so much the specific programs or events sponsored by OWA that are important but the fact of its being there as a focal point for women to come together and act together ", she wrote. Nan planned and participated in many OWA events. Last September at the OWA retreat Nan helped with the Calder-like mobile making project at Westerbeke Ranch. In December she volunteered along with other OWA members to work on the Master Planning Services for the ranch. In the early 1990's Chet Ward became ill and Nan traveled the seven hours to Gasquet each month to be with him. When he died in 1994, Nan set-up the annual Chet Ward Scholarship with a local environmental group, The Friends of Del Norte. Nan was also active with environmental group, The Smith River Alliance, opposing a nickel mine threatening the river. In 2000, Nan began to remodel the cabin in Gasquet. It was her retreat and she loved to entertain there. The views from the deck were breathtaking of the pristine turquoise Smith River below. Later that year Gasquet resident, Judson Brohmer and his two terriers became Nan's companions. Back in San Francisco, Nan was working on challenging projects and said she was thriving and enjoying her confidence and abilities as an architect. For 14 years she happily worked for John Mathews Architects in San Mateo. At this small firm she found respect, kindness, and closeness with her colleagues. About working in architecture she said, "You need a situation which encourages and allows your creative contribution, but you need to push too. You have to add your voice, look for opportunities, and defend your ideas." Nan Croley died on March 23, 2006. Valerie Surh is a project management assistant with Glide Health Services in San Francisco. Glide Health Services is one of the several departments within Glide Foundation, a San Francisco non-profit serving the poor and marginalized community. She is currently helping organize the health clinic's renovation and is working closely with the renovation's contractors. Valerie attended the University of California at Los Angeles where she graduated in 2005 with a B.S. in Physiological Sciences. She initially planned on a career in healthcare, but has changed course since college due to a keen interest in architecture, a field more closely suited to her creativity. Hoping to gain more exposure to architecture, she contacted Mui, who introduced her to OWA. Valerie is taking a drawing class through Berkeley Extension and plans on pursuing a master in architecture in the near future. She lives in Alameda, where she was born and raised, and spends her free time cooking, drawing, and traveling. Suzanne Stewart is a space planner and FF&E designer on residential remodels in the Bay Area. She graduated from the UCB-X Interior Architecture and Design program. Her work has included project management and design for boutique hotel renovations in San Francisco. Suzanne is a former docent at the SFMMA; a reluctant gardener, and pretty good cook. She is delighted to be part of OWA and looks forward to serving on the Steering Committee. Suzanne lives in Berkeley with her family. For our own archive and for the International Archive of Women in Architecture, Janet Crane and Inge Horton are looking for OWA Retreat Folders from past years. Inge has folders of 1988, 1989, 1990, 1991, 2000, 2001, 2002, 2003, 2005 and would like to get copies of the missing years: 1992-1999, and 2004. You might bring your folders to the OWA retreat in September or you could contact Inge at ingehor@pacbell.net. Thank you for your help in preserving a part of OWA history.